If you’re a TDS customer who lives in the Madison, Wis. area, you could win tickets to our rooftop party! We’re taking over the Madison Mallards’ Duck Blind rooftop on July 11th and we want you to come. 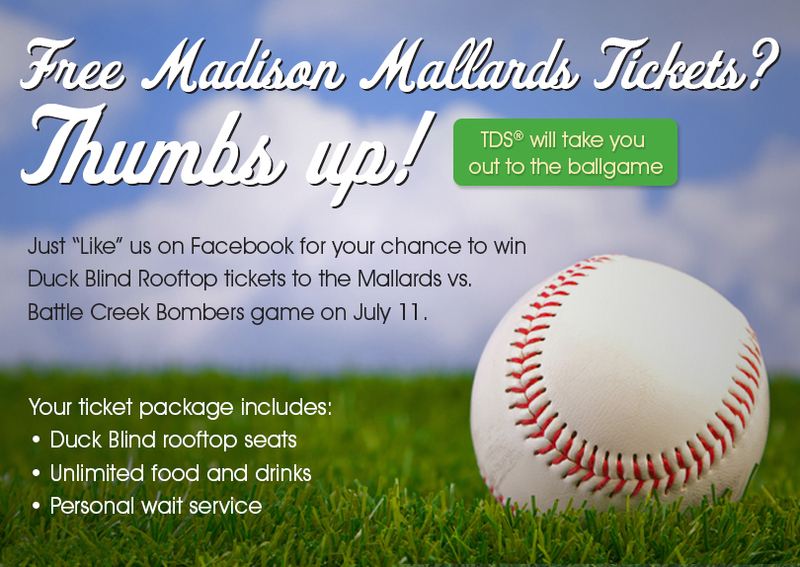 We’re giving away 180 tickets to the best seats in the house for the Mallards vs. Battle Creek Bombers game. All winners will get two tickets, unlimited food and drinks, plus a TDS swag bag full of goodies. And if that wasn’t enough, TDS TV’s own Clicky will be there to add some extra fun. You can enter to win on our TDS TV Facebook page (look for the “Madison Mallards Giveaway” tab right under our cover photo) until midnight on July 5th. We’ll announce the lucky winners on Monday, July 6—we can’t wait to see you!